Greenville South Carolina might be in the South, but it is hardly Southern. At least not in that laid back, sleepy sort of Southern way that is accentuated by a sweet southern drawl. 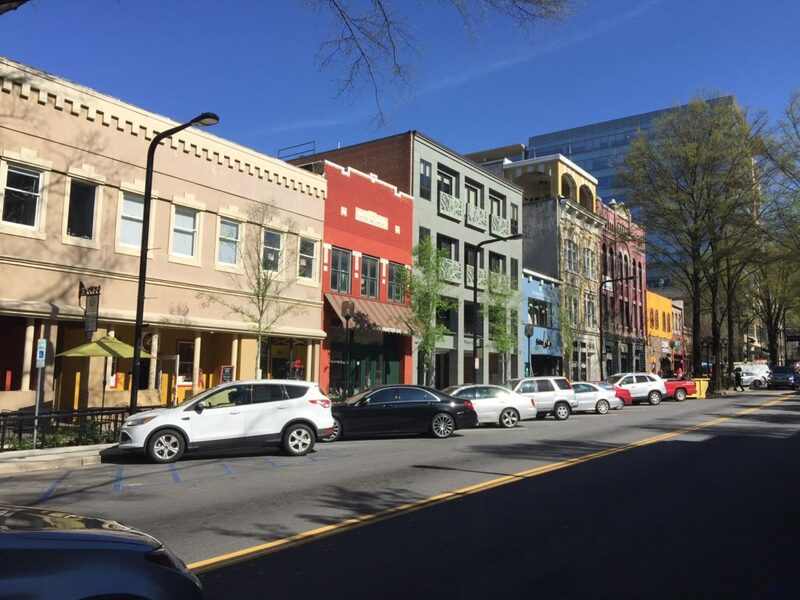 We teamed up with Expedia.com to show you that Greenville SC, rather, is a vibrant metropolis filled with surprises and topped with a generous helping of southern charm. 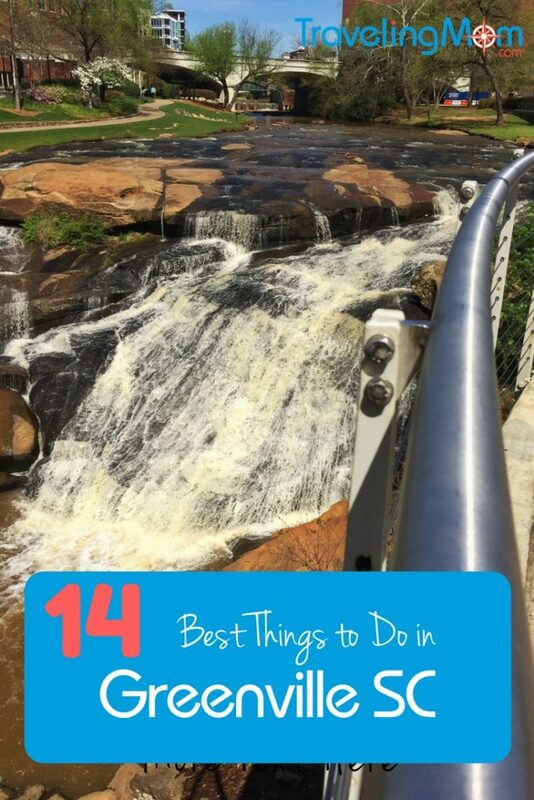 There are lots of fun things to do in Greenville with kids and lots of reasons the hashtag for this town is #yeahTHATgreenville. The centerpiece of Greenville is a rushing waterfall. Right there in the middle of town. We have the Carolina Foothills Garden Club to thank for it. For years, the Reedy River and its waterfall had been lost to the city. The water was polluted by textile mills that later closed and abandoned the riverfront. The area was soon buried under overgrowth. Then it was covered by an interstate highway. That lasted until the visionary members of the garden club went to work, slowly reclaiming small sections of the city center. Finally, the long-time mayor, Knox White, convinced city leaders to spend $13 million to demolish the highway bridge and build what is now Falls Park, a shining example of urban reclamation and political vision. 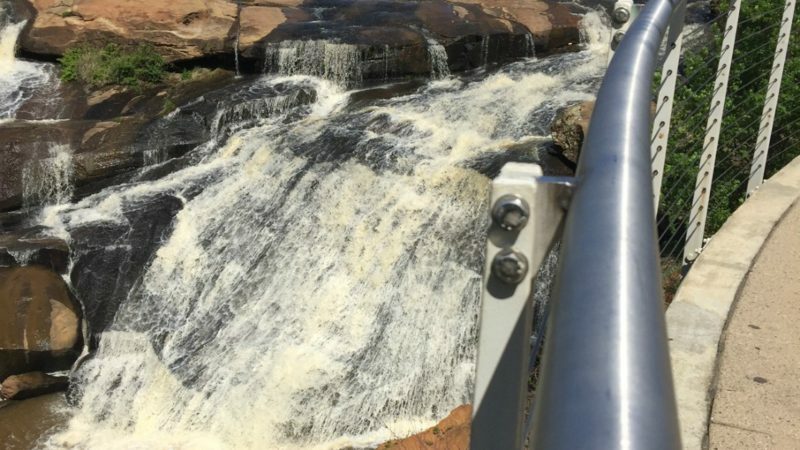 For more waterfalls in the southeast, check out these waterfalls in Georgia. In place of the highway that once covered the waterfall and obscured the view, the city has built The Liberty Bridge. It’s a 345-foot, curved walkway held in the air by a single suspension cable. I was so taken with the beauty of the falls as we wandered along that I was not really thinking that a suspension bridge is, um, suspended. When a group of runners pounded past, the bridge flexed. I immediately screeched and grabbed for the railing as my husband looked on and chuckled. Fortunately, the bridge held and I recovered my dignity in time to not screech when the next group came rumbling past. Falls Park is the lovely urban greenspace that surrounds the waterfall. We found a seat and settled in to watch the water cascading down. We were joined by hundreds of people—families who sat on blankets while the kids ran nearby, office workers eating their lunch in the shade of a tree, tourists taking selfies and more. It was a lovely spot to while away an afternoon. Take a Bike Ride. Or a walk. Greenville SC is part of the GHS Swamp Rabbit Trail. 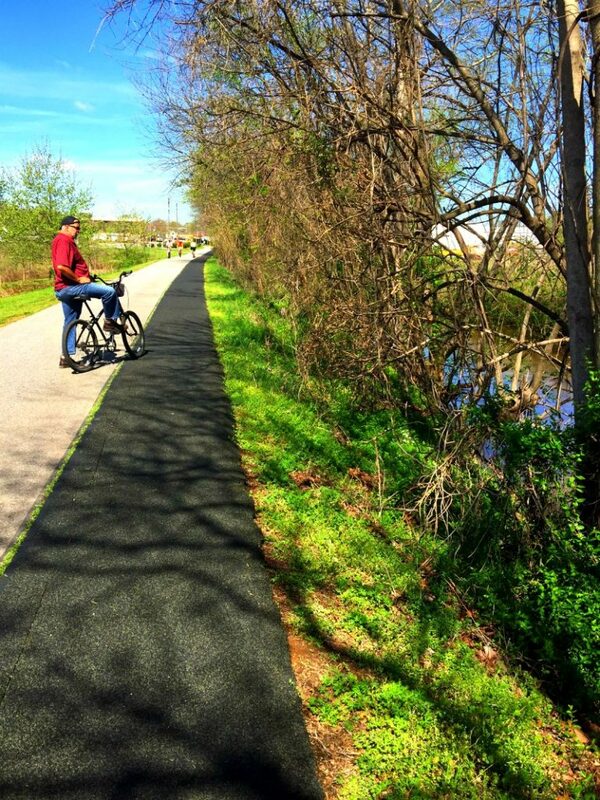 That is a 19.9-mile multi-use urban trail that runs alongside the Reedy River. It has garnered multiple awards as one of America’s best urban biking trails. It’s easy to see why. We headed to Reedy Rides where we rented bikes and helmets and headed for the trail. The bikes worked well and the flat trail made for easy biking. We only had time to ride a couple of miles. Had we more time, we would have kept going, comforted to know that there are bathroom stops at several points along the way. If you prefer to walk, you can do that on the trail too. Just remember to walk on the right side of the trail and keep an ear open for bikers riding past. We stopped for lunch at Grill Marks and were very glad we did! These gourmet burgers and the accompanying fried pickles, french fries and onion rings are some of the best I’ve ever eaten. The restaurant is famous for its burgers and “adult” milkshakes. Yeah. Those were pretty good too. 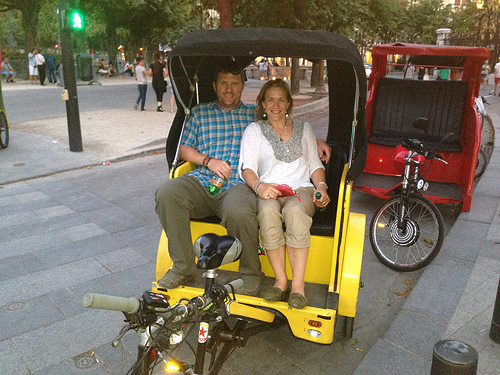 Hey—we had been biking, so we deserved it. 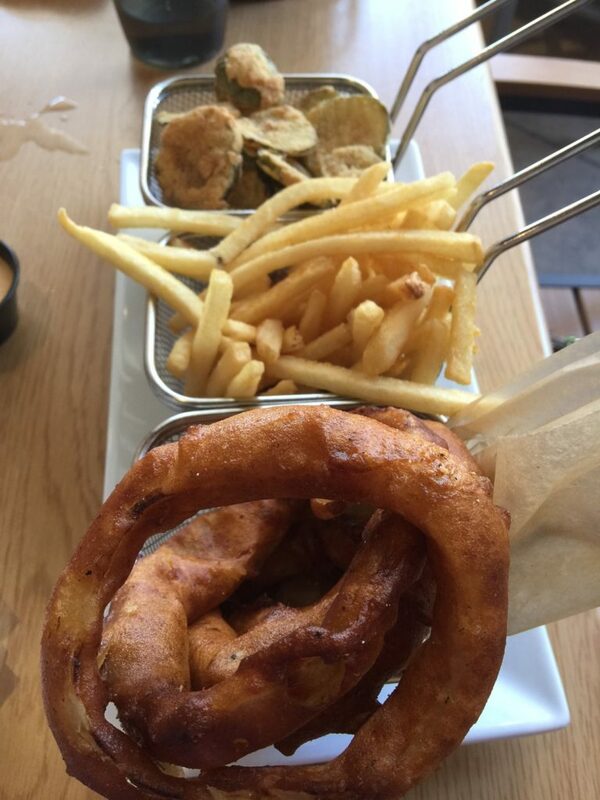 You will want to come hungry. The portions are very, very generous. As its name suggests, this is the main thoroughfare of Greenville SC. It’s an easy walk from one end to the other and it’s worth a leisurely stroll. The street is lined with small boutiques and locally owned shops and restaurants. But it’s also home to more than 70 pieces of public art. An “Orbital Trio” serves as the anchor of North Main Street downtown at NOMA Square. “Nexus of Light” anchors the corner of South Main Street and Augusta Street. “Octo 2” is a kinetic, wind-powered stainless steel sculpture made up of linked stainless shapes rotating around a circular axis. Photo courtesy City of Greenville. 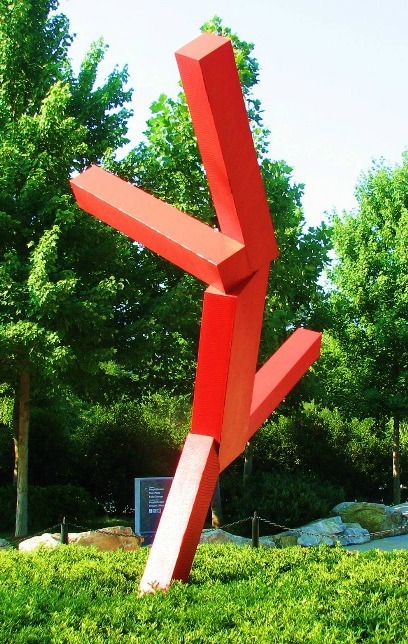 The red steel “Untitled 2002-2003” sculpture (referred to by residents we talked to as Gumby) winds up in the background of almost every iconic photo take in Greenville as it sits at one end of The Liberty Bridge in Falls Park. And the newest Dale Chihuly “Rose Crystal Tower” sits at the other end of Falls Park. Scattered along Main Street are these cute little mice. And the city history is depicted in other statues. I’m not a big shopper, but if you are, Main Street is the place to be. The street is lined with cute boutiques. 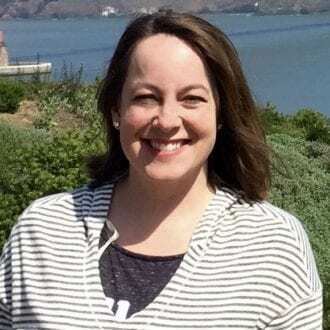 I was particularly intrigued by one that promised “custom fit jeans.” Beija-Flor Jeans was started in 2005 with a mission to design jeans to fit real women’s bodies. Who doesn’t want that? The product line features four core designs made with memory stretch, advanced technology fabrics. Best of all, the jeans have a contoured mid-rise, no gap waist. The proprietor fitted me for a pair of jeans in a slim leg style that I never would have chosen on my own. 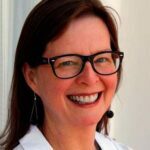 She convinced me I should try them on—and I was surprised to find she was right! On North Main, is Mast General Store. 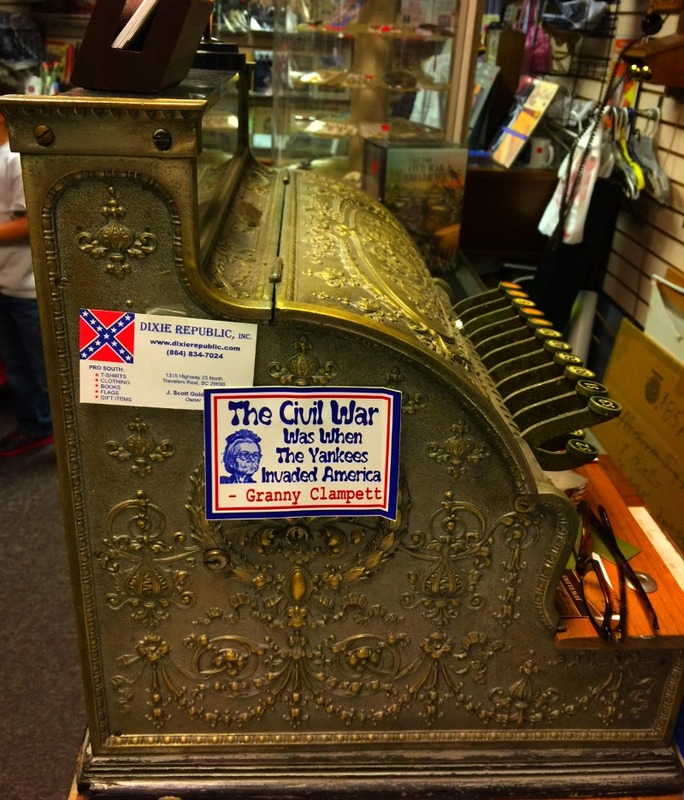 It’s filled with penny candy barrels and the wood floors actually creak as you walk on them. 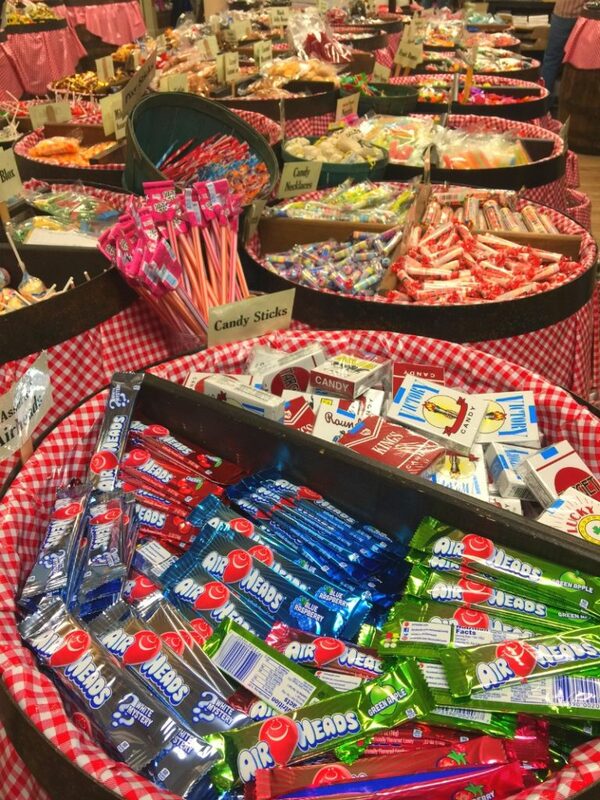 For years this was the only shop on Main Street if you needed to pick up something or forgot something for your travels. Our guide was John Nolan. 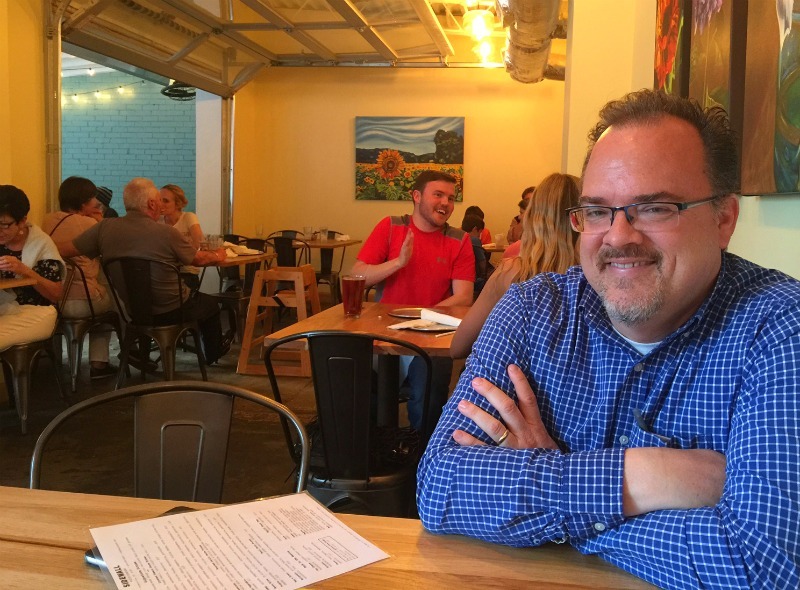 He proved to be a font of knowledge about Greenville and its foodie scene. And oh what a scene it is! We sampled gourmet popcorn at the exceedingly cute Poppington’s Popcorn and ate a chef’s sampler of dishes at Nose Dive (a much classier place that its name suggests). We were stuffed by then, but still needed to taste the unique pizza offerings at Sidewall Pizza. It’s in a converted garage (which gives it a hip vibe). We nibbled a bit, but we were too stuffed to really eat anything there. Besides, we’re from Chicago, so we can be pizza snobs. By then, we were overdone and decided to skip the dessert at Brick Street Café. In full service mode, John took us back to our hotel—then headed to Brick Street, where he picked a piece of the most delectable cake and had it delivered to our room. Hubby and I couldn’t resist polishing off the whole thing. As I look back on it, it’s kind of hard to believe how much we managed to eat in 48 hours! But dinner at the ultra hip Ink & Ivy was a definite highlight. The service was top notch, the converted loft space appealing, and the food excellent. My only complaint was the sound level. The pounding music added to the ambiance but made it impossible to talk without yelling. On our way out of town, we stopped for a bite at Bacon Brothers Public House. The intriguing name made me think that the menu would be filled with bacon-infused yumminess. There definitely was a pig theme, but less bacon that we expected. Up on the Roof is the place to be. This hip spot is an indoor/outdoor bar on the rooftop of the Embassy Suites hotel. 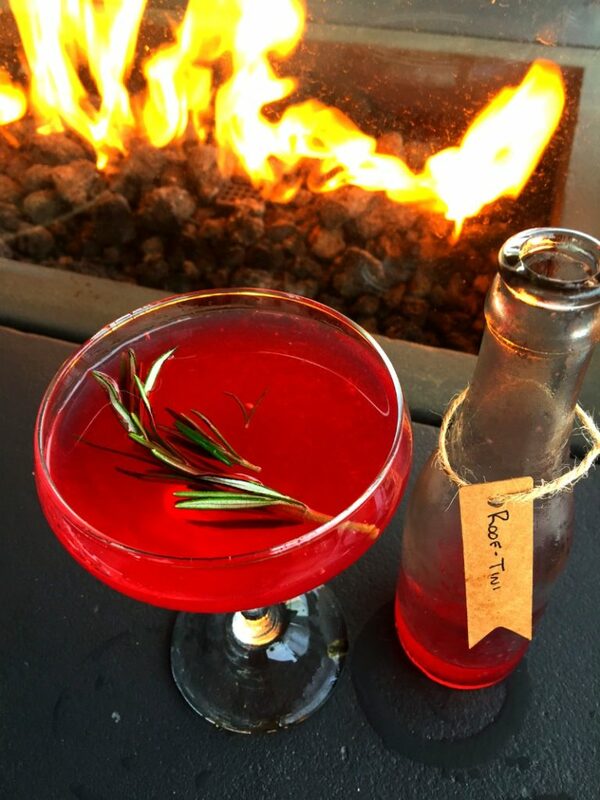 This sophisticated spot has great views over the Greenville rooftops, but the real stars of the show are the drinks. They’re homemade and bottled on site. We had fun taste testing the offerings while warming ourselves on a cool rainy night around the cozy firepits that dot the outdoor terrace. This urban arts and cultural campus is home to the Upcountry History Museum, the Children’s Museum of the Upstate, Greenville County Museum of Art and Bob Jones Museum and Gallery. It’s the sort of place you could spend much more than a day. If you’re traveling with kids (which we weren’t), you’ll need to plan at least several hours for the children’s museum. Our 2-day trip meant we only had time for a quick look at the children’s museum. Then we spent about an hour in the fascinating Upcountry History Museum. Plan for more time if you want to really digest the info about the history of Greenville and the South. This science center is all about education. The vast majority of the time, it’s open only to lucky Greenville students. But on the second Saturday of the month, look for science programs open to everyone. And on Friday nights, the planetarium is open for star gazing. If you’re in town, check the Roper Mountain website. If there is a public program available during your visit, don’t miss a chance to introduce your kids to the most fun they can have with science. Hubby is a car guy, so there was no way we could leave town without a stop at the BMW Zentrum visitors center. The 28,000-square-foot center showcases BMW’s car history. After spending time at the National Corvette Museum in Kentucky, we were a little disappointed to find that this was primarily a car showroom. There were some cool cars to look at, but the company’s history in aircraft, motorcycles and automobiles was mostly available virtually, on a big screen. Check out these free things to do with kids in the Southeast US. Courtyard by Marriott is my go-to brand for family travel. I love the extras that are included—wifi, an expansive breakfast and extra room, which is so important when you’re traveling with kids. 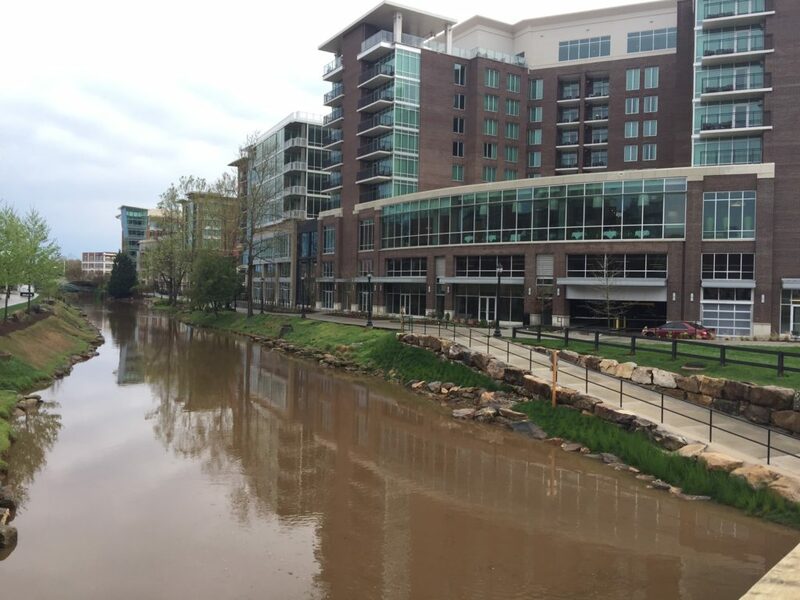 The Courtyard by Marriott in downtown Greenville offered another amenity—it’s within walking distance of just about everything we wanted to do in this charming, walkable town, from visiting Falls Park to eating our way down Main Street. As an added bonus, it’s just across the river from the Up on the Roof bar! Disclosure: I was hosted by Visit Greenville SC for the purposes of seeing the city and writing this post. Opinions are all my own. 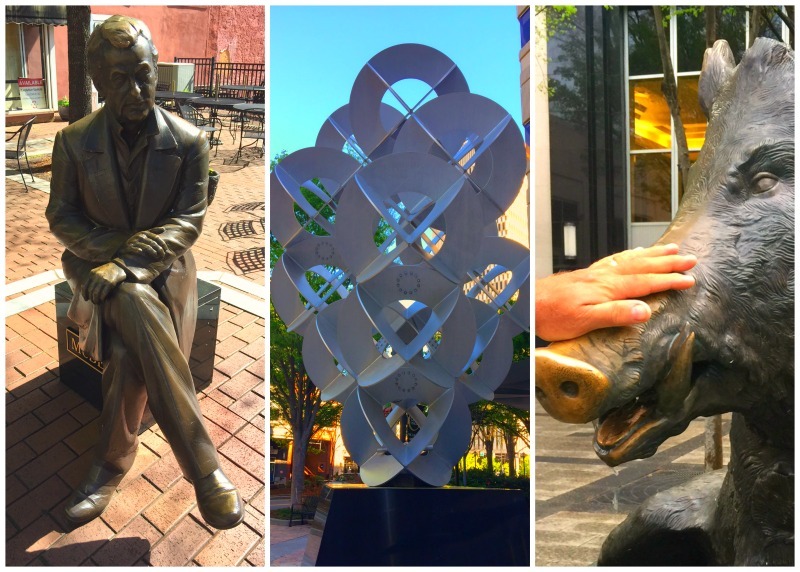 Have you been to Greenville SC? What is your favorite thing to do there? I go there a lot since it’s my neighboring city! I love events at the Peace Center and the Bon Secours Wellness Arena, anything outdoors at Falls Park, and riding the Swamp Rabbit Trail. And Beija-Flor jeans are my absolute favorites!!! I spent half a day at the Museum of Art and the Chikdren’s Museum. So fine I need another day for the new Music Museum in the Heritage Green complex, and the Upcountry History.